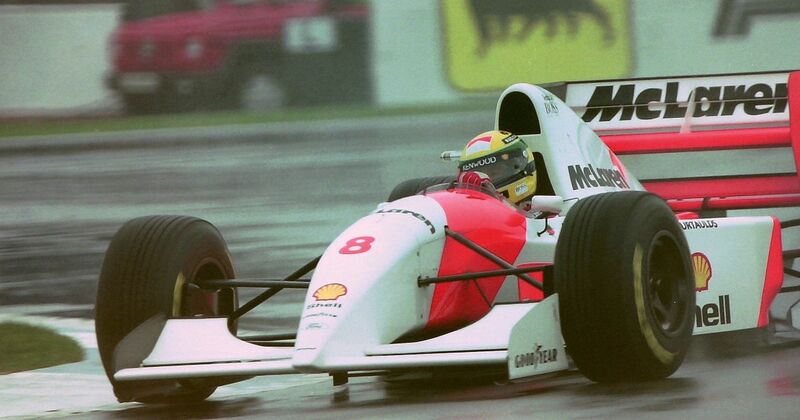 At a very wet Donington Park, Ayrton Senna put in one of his finest drives as he dropped to fifth place at the start, took the lead by the end of the first lap and went on to win by almost a full lap from Damon Hill and Alain Prost, as he made a staggering seven pit stops in the constantly changing conditions. During the race, Senna came into the pits for a stop, only to discover that his team wasn’t ready for him, so he blasted back onto the circuit. Because these were the days without a pit lane speed limit and because the pit lane at Donington was actually something of a shortcut, it meant that Senna’s aborted stop turned out to be the fastest lap of the race. 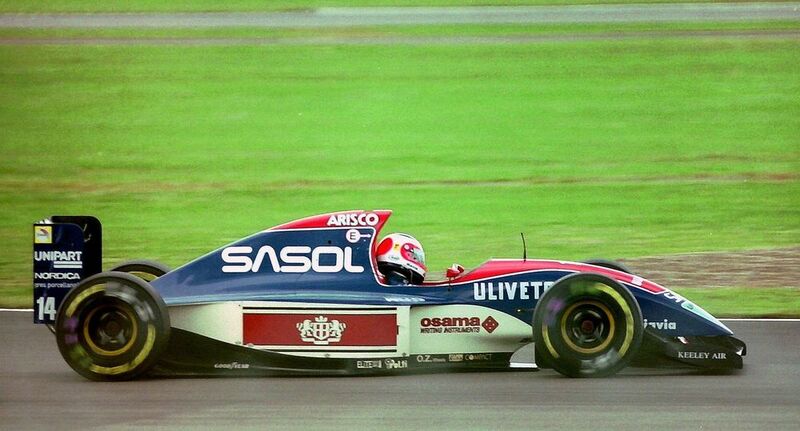 Another quality drive came from a young Rubens Barrichello, driving for Jordan in just his third grand prix. He went from 12th to fourth on the opening lap and not only stayed there for much of the race, but was actually on course for a podium until he sadly ran out of fuel with just five laps to go. Rubens Barrichello brilliantly led the early stages of his home race for Stewart as he benefitted from a gearbox glitch which caused early leader Mika Hakkinen to drop to third. Barrichello pitted earlier than Hakkinen on Michael Schumacher as he was on a two-stop strategy, but his chances of a home podium (or maybe even more) were ended when his engine failed last after half-distance. Hakkinen then leapfrogged Schumacher during their sole stops and carried on to victory, with Heinz-Harald Frentzen a slightly lucky third for Jordan - he ran out of fuel on the last lap, but as everyone behind him was a lap down on the leaders he didn’t lose any positions. Robert O’Brien (born 1908) entered one race, the 1952 Belgian GP, driving a privately-entered Gordini. He was a staggering 74 seconds away from pole during qualifying around the long and fearsome layout of old Spa - though he did reach the finish in 14th place, six laps down on race-winner Alberto Ascari. Pete Lovely (born 1926) attempted to make his debut in the 1959 Monaco GP but failed to qualify. He returned for the 1960 US GP where he finished 11th, but it would be a staggering nine years before he returned to an F1 grid. In the 1969 Canadian GP he finished a career-best seventh and carried on making sporadic F1 appearances until 1971.